Crewest Gallery News: Happy Bday to us! 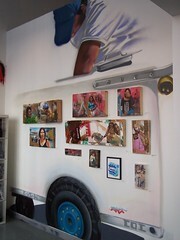 CINCO: view the artwork from the show.. Originally uploaded by The Crewest Man. This month we turn 5 Years old and we're celebrating! In the past 5 years we've seen alot of things happen: galleries come and go, shops open and close, writers start and stop, homies celebrated and mourned, wars starting and unfortunately still going on....Yet some how we've not only been able to keep our doors open, but expand and grow to a new Downtown location which is thriving and flourishing. We thank all of you for all your continued support and helping our dream of supporting artists and expanding L.A. graff and urban art throughout the globe. Join us every weekend in May as we throw a little sum' sum' to be festive about.